Although evidence supporting the benefits of ketogenic diet therapies continues to mount, there is little to guide those who wish to adopt this diet as a metabolic therapy for cancer. Keto for Cancer fills this need. 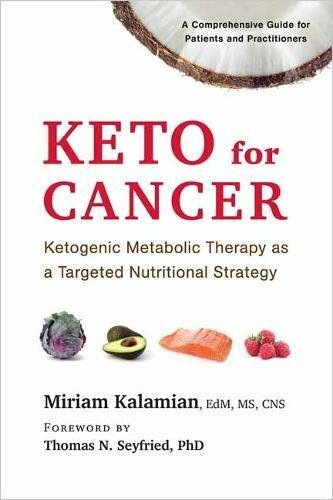 Inspired by the work of Dr. Thomas N. Seyfried, PhD, nutritionist Miriam Kalamian has written the first book to lay out comprehensive guidelines that specifically address the many challenges associated with cancer, and particularly the deep nutritional overhaul involved with the ketogenic diet. Kalamian, a leading voice in the keto movement, is driven by passion from her own experience in using the ketogenic diet for her young son. Her book addresses the nuts and bolts of adopting the diet, from deciding whether keto is the right choice to developing a personal plan for smoothly navigating the keto lifestyle. It is invaluable for both beginners and seasoned users of the ketogenic diet, as well as for health-care professionals who need a toolkit to implement this targeted metabolic therapy. Kalamian also discusses important issues such as self-advocacy. Readers of Keto for Cancer are empowered to “get off the bench and get in the game.” To that end, Kalamian offers tips on how to critically examine cancer-care options then incorporate what resonates into a truly personalized treatment plan.